What is Writing on Spec & Should You Do It? Before we can talk about whether you should or shouldn’t write on spec, it’s important to know what it means. Writing on spec means “speculation.” Another good word for it is assumption. 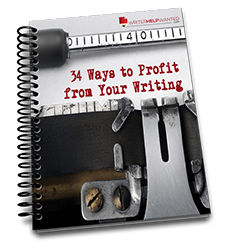 You’re writing and assuming or hoping the client will like it enough to pay. There are many pros and cons to writing on spec. When you write on spec you’re taking a risk. You’re putting hard work into a project with the potential that you might not get paid. So why do it? Why take that risk? Writing on spec is a way to prove yourself. It’s a great way to get your foot in the door with your ideal client. For example, if you write for the health and wellness industry and Rodale is an ideal client, why not write on spec for them. The opportunity to write and demonstrate your skills might be worth the risk. Even if the client says “No thank you” you still gain experience. The client may say no thank you. However, they might invite you to try again. With their feedback you may be able to get it perfect the next time. Regardless of whether you get paid or not, you can still add the project to your portfolio of samples. You did the work. You can take the credit. Finally, there is the chance that you might actually get paid for the work. Then you not only get your foot in the door you also get a paycheck. You may also get a lifelong client who respects you for taking a risk. The most obvious con for writing on spec is the risk that you don’t get paid for your work. This is definitely a risk. There are many reasons why a client may reject your work. It may not fit their needs. Their needs may have changed mid-project. They may have simply found a different writer. Another con is that if you do a horrible job on the project, you may never get another chance to work with that client again. However, chances are if you’re writing on spec, you’re going to give it your best try. And that means it won’t be horrible. If you’re writing on spec to get a paycheck then it’s probably not a good idea. However, if you’re writing on spec to get your foot in the door with your ideal client, it may be worth the risk. Evaluate the risk versus reward before you take a spec assignment. If you’re confident you can do a good job and the client is worth it, take the risk. There’s very little to lose.